/ Update all apps on my Amazon Kindle Fire HD? Update all apps on my Amazon Kindle Fire HD? I love my Kindle Fire HD from Amazon but have realized I have no idea how to update the apps on the device. Is there some secret “update all apps” button somewhere? Congrats on the savvy move of getting a Kindle Fire HD from Amazon. They’re great little devices and a really quite inexpensive way to end up with a big, bright, color Android tablet, with all the extra layers of Amazon goodness on top. Much more than just an eInk Kindle, that’s for sure, and for just a few dollars more. And these are great for kids too when you add a kid-proof case for a few dollars. Note: Currently the 8-inch Fire HD is $79 including shipping. A crazy good deal! Now, on to your request. The Fire HD runs a sort of hybrid Android + Kindle operating system and so there aren’t standard Android applications like Google Play, which is where you normally would look for the app update feature. Instead, Amazon has its own Kindle version of the program and that’s where you’ll want to go instead. The actual interface within the program is completely identical once you’re in the program! Here’s my main screen with all the game and program app icons shown. Yes, my kids use the device too! Second row, middle icon: apps. That’s what you want, the Kindle Appstore. Assuming I can resist Candy Crush Saga, Game of War: Fire Age, and Slotomania Casino, we can proceed. And that’s done by tapping on the hamburger menu (three horizontal lines stacked atop each other) on the top left of the screen. Okay, the menu’s not exactly like Google Play if you’re an Android fan, but it still makes sense, I think. Tap on “App Updates“, the fourth entry, to see what updates are available for your programs and apps. 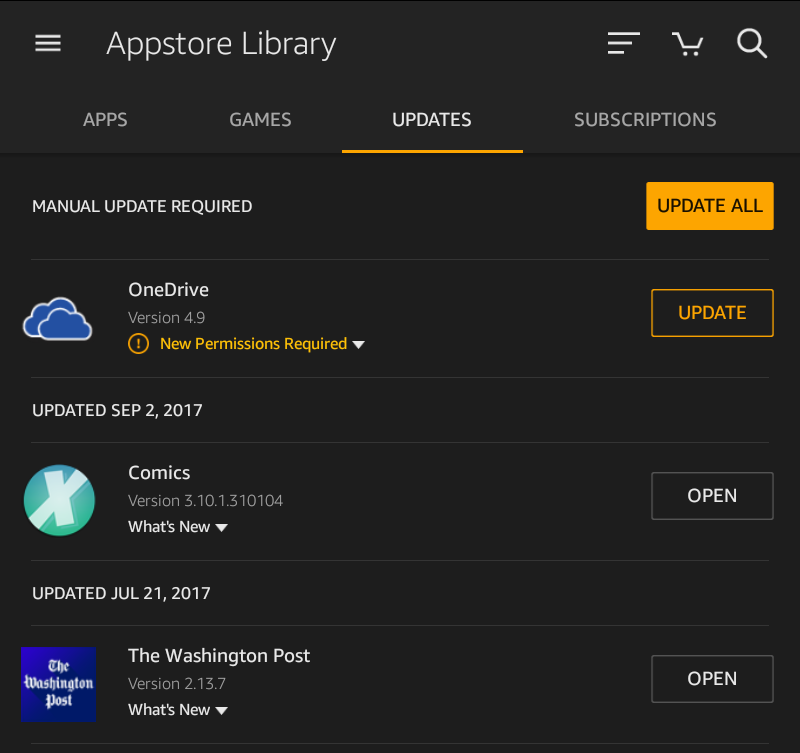 Looks like the only update I have is for OneDrive from Microsoft, and that the Comics app updated just a few days ago. The easy way to go is to always just tap on “Update All” but if you’re curious about what’s in a particular update, you can tap and learn more by tapping on “What’s New” or, in this instance, “New Permissions Required. In the case of OneDrive, sure seems like it has a lot of permissions it requires, doesn’t it? Are there any permissions that it doesn’t need? Ah well, I’ll update it anyway. A tap and – as you can see above – it’ll download, then install and you’ll be done. Easy enough once you know where to find that “Update All” button.